Step onto the ferry and into the wild. Enjoy birding, hiking, beach combing, and naturalist-guided tours within Cape Romain National Wildlife Refuge. Pictured here, sunrise at Boneyard Beach on Bulls Island. Photo by Tom Blagden. Coming to Charleston with a group? Let's get something planned that will be the highlight of your time in the Carolina Lowcountry! Pictured here, all smiles after a day of hiking on Bulls Island and an impromptu Trust Fall with the group. If you really want to get a feel for the local history, identify the native wildlife, and get to special places, you'll need someone experienced to show you the way. We'll get you there. Pictured here, a bottlenose dolphin checks out a kayaker as they paddle by on a salt marsh estuary tour. We saw a need for basic camping and survival skills for thru-hikers, weekend warriors and families. 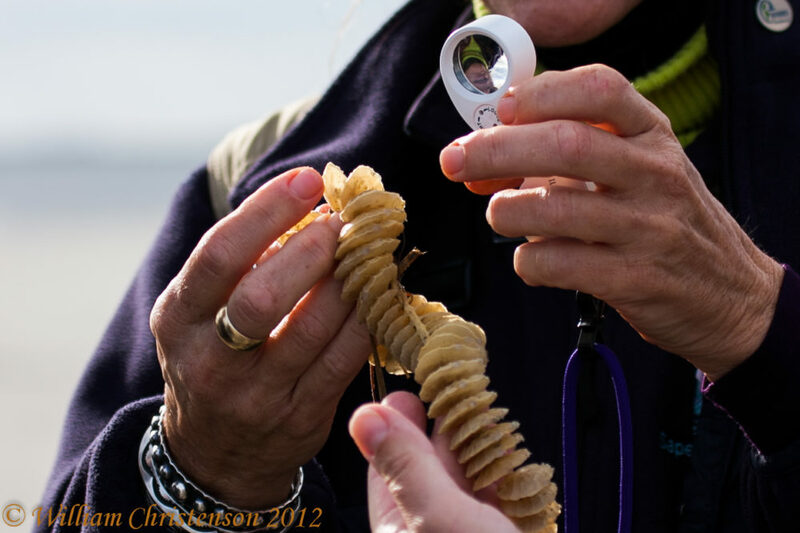 Coastal Expeditions guides, with Kevin Regan at the helm, have started to develop a stable of workshops to teach you the basics and more. Learn how to make fires, spears, fishing equipment, shelter and more from the materials that surround you in nature. We offer workshops throughout the year or you can sign up your group or school for a private class. Take some time to learn more about the things that fascinate you and be reminded of what drew you to the Lowcountry. Our guides have so much to share about the Lowcountry, and as you learn more about our resident birds or how to identify native plants, your appreciation grows. These workshops are designed to fit into your busy schedules are are either offered in the evenings or as weekend jaunts. Explore. Chat. Visit. And come on back, y’all. Take in the stunning beauty of local creeks and waters from one of our kayaks or SUPs. Walk-ups are welcome or call / text to book and we’ll be ready when you are. All gear and instruction provided. Call or text 843.884.7684 to book. Check out our Shem Creek in Mount Pleasant tours. Take in the stunning beauty of local creeks and waters from one of our kayaks. Walk-ups are welcome or call / text to book and we’ll be ready when you are. All gear and instruction provided. Check out our Isle of Palms tours. Check out our Folly Beach tours. Check out our Blackwater tours. Check out our Bulls Island tours. Check out our Uncategorized tours. Which location is most convenient? How much time do you want to have?